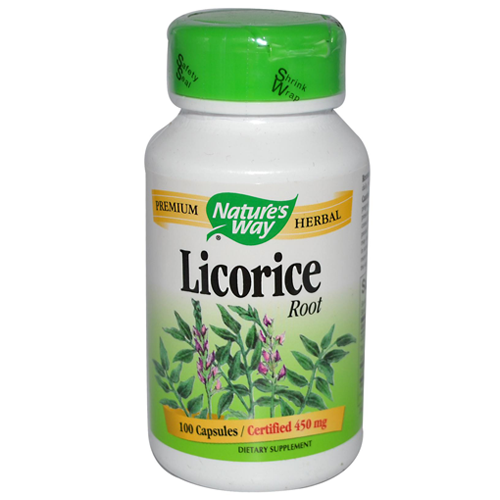 Licorice (Glycyrrhiza glabra) is a member of the legume family and is one of the most widely used medicinal herbs in China where it is used to treat a variety of conditions. Glycyrrhizin, an eye mangling word if ever there was one, is Licorice's main constituent. It is 50 times sweeter than sucrose. Click here for Deglycyrrhizinated Licorice supplements. Do not use this product if you are pregnant or nursing. Persons with high blood pressure, heart disease, or kidney disease should consult a healthcare professional before using this product. 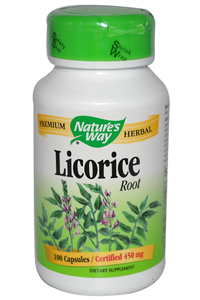 Prolonged use of high doses of licorice root may lead to high blood pressure and fluid retention in some persons. Continuous use of this product for more than 4-6 weeks should only be done under the supervision of a healthcare professional.